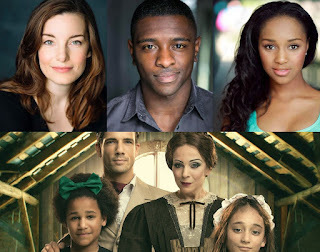 Updated 25th April: More star casting has just been announced for the UK premiere of the musical A Little Princess: joining the previously announced Amanda Abbington in her musical debut as Miss Minchin and Danny Mac as Captain Crewe are Olivier Award winners Rebecca Trehearn (Julie in ShowBoat, City of Angels) who will play Miss Amelia and Adam J. Bernard (Jimmy Early in Dreamgirls) who will play Pasko. Alexia Khadime (Elphaba in Wicked star) will join the cast as Aljana. Thousands of youngsters auditioned for the 10 child star roles, and the successful girls are: Jasmine Sakyiama (in the title role of Sara Crewe), Jasmine Nituan (Becky) with Madeline Banbury, Delilah Bennett-Cardy, Sophie Beswick, Olivia Cowley, Tia Figgett, Andie Jordan, Agatha Meehan, Natasha Raphael, Kate Woodman. Sherlock star Amanda Abbington and Sunset Boulevard leading man Danny Mac are the first cast members to be announced confirmed for the UK premiere of new musical A Little Princess by Tony-nominated composer/lyricist Andrew Lippa (Big Fish,The Addams Family, The Wild Party). Andrew Lippa is flying over from the States to conduct this one off semi-staged London concert performance featuring the Royal Philharmonic Concert Orchestra at the Royal Festival hall at 7:30 pm on Bank Holiday Monday 28th May, 2018. It will be directed by Multi Olivier Award-winner and Tony Award nominee Arlene Phillips CBE. A Little Princess, with with abridged narration by Brian Crawley (Violet), is based upon Frances Hodgson Burnett’s classic childhood novel. It tells the story of Sara Crewe, who is sent from her home in Africa to boarding school in London and separated from her father. As young Sara’s world is turned upside down, she must rely on her friends and imaginative powers to overcome her strict headmistress Miss Minchin and prove that every little girl deserves to be a princess. Amanda Abbington will play Miss Minchin in her musical theatre debut. SShe is best known for playing Mary Morstan, the wife of John Watson, in the BBC's global hit Sherlock (for which she was nominated for a Critics' Choice Television Award, for Best Supporting Actress in a Movie/Miniseries) and series regular Miss Mardle in Mr Selfridge. Danny Mac, will play Captain Crewe. He is currently starring as Joe Gillis on the UK tour of Andrew Lloyd Webber's Sunset Boulevard, was acclaimed for his starring role in On The Town at Regent's Park Open Air Theatre and was a finalist on last year's Strictly Come Dancing. Thousands of youngsters have already been auditioned for 10 child star roles. Further casting and full creative team are still to be announced.